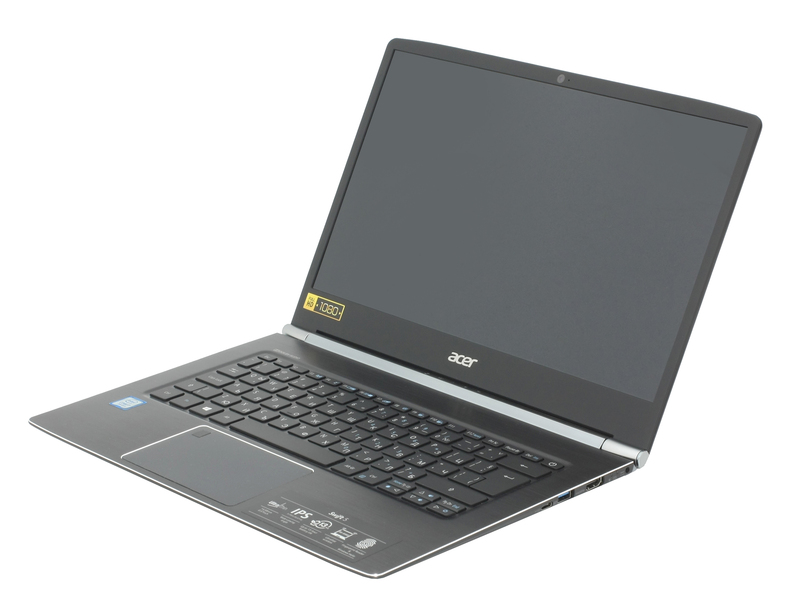 Remember the Acer Aspire S 13? Well, the Acer Swift 5 is basically the same notebook that costs a little bit more but also offers more in return. Or in other words, a good upgrade over the Aspire S 13. We have the new generation Core i7-7500U rocking under the hood, good choice of materials, robust construction, extremely portable and also accommodates a 14-inch screen in a 13-inch form factor thanks to the super thin bezels. Back at IFA 2016, the Swift 5 was outshined by the Acer Swift 7 but in our opinion, if the luxurious design isn’t your top priority, the Swift 5 will be a much better fit for your daily needs. It offers all the features the Swift 7 can’t give you and costs considerably less than its thinner sibling. See what else, in the review below. 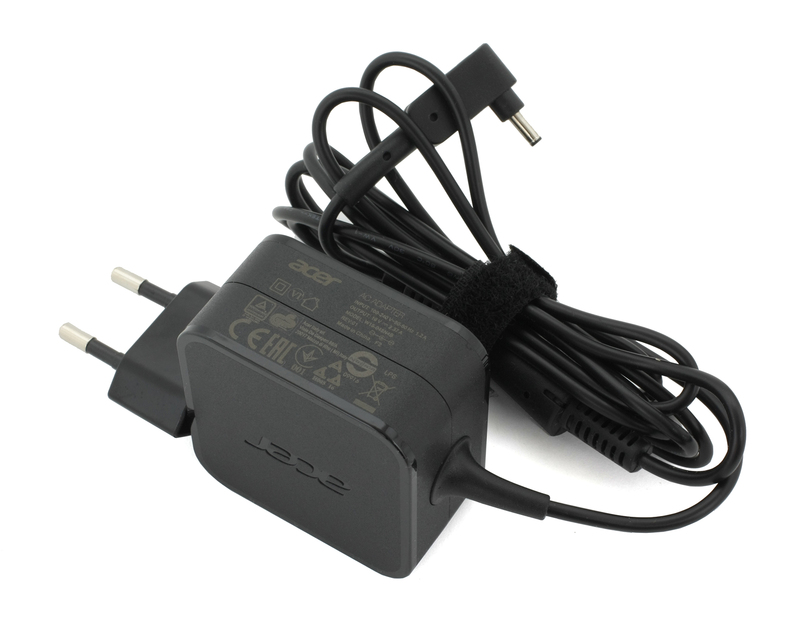 The notebook comes in a standard black box containing the usual user manuals, AC adapter, power cord and the laptop itself. 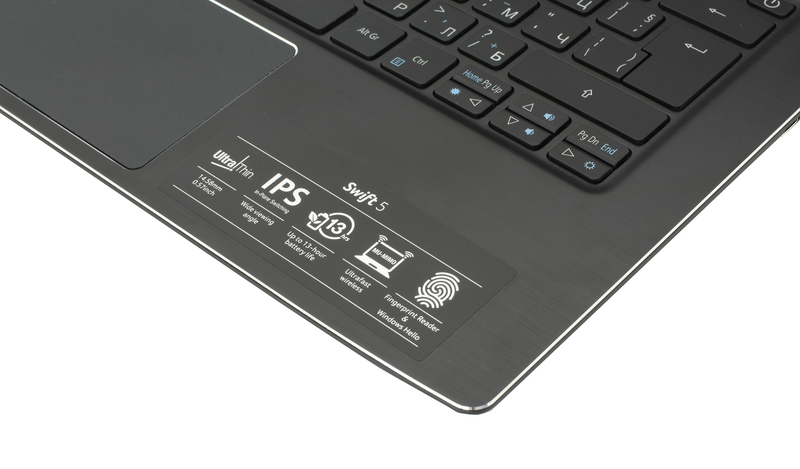 The Swift 5 borrows the design concept of the Aspire S 13, which also looks quite similar the famous Aspire V 15 and V 17 Nitro laptops with patterned plastic finish on the lid but there’s more than it meets the eye. The Swift 5’s construction uses the same nanoimprint lithography process for the construction infusing aluminum sheets below the plastic surface giving extra rigidity without sacrificing weight. This method has worked for a few generations and a number of other Acer notebooks, so we are happy to see it in the Swift 5 as well. Another noticeable similarity is the brushed aluminum interior and the silver accent of the hinge caps. Anyway, as we already mentioned, the lid uses a plastic finish with stripe patterns while the aluminum beneath aids for better rigidity. And trust us, it’s no gimmick because pressing the center of the lid doesn’t cause the plate to sink in easily. It feels quite stable and it isn’t susceptible to flexing either. The hinge feels good at the beginning of the travel and requires only one hand but after you reach 1/4 of the movement, a second hand is required to hold the base. Hinges feel a bit overly tightened. As for the 14-inch screen, it uses glossy finish and super thin side bezels. 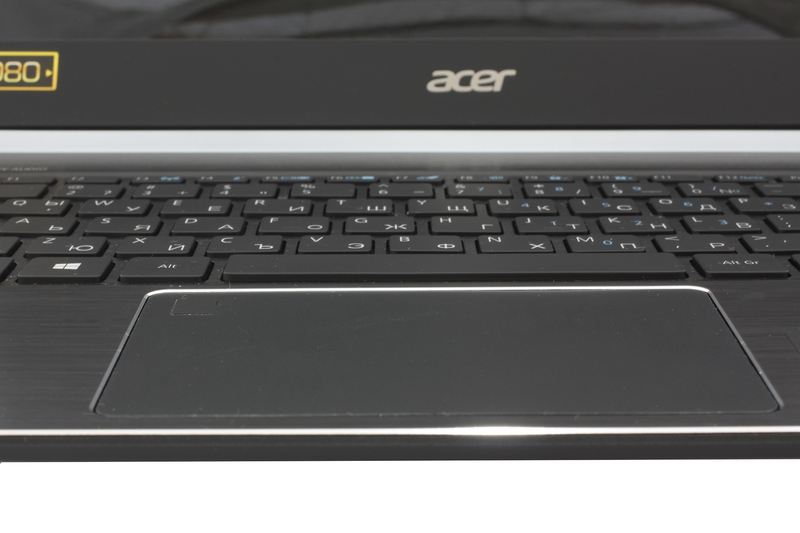 Only the chin stands out and kudos to the engineers over at Acer being able to cram up the webcam on the top bezel. There’s a handful of users complaining about the awkward positioning of the webcam in the XPS 13 and XPS 15 notebooks from Dell, which is also famous for their extremely thin screen bezels. The bottom of the base uses soft-touch matte plastic that feels exceptionally nice and integrates the usual vent openings for extra airflow. 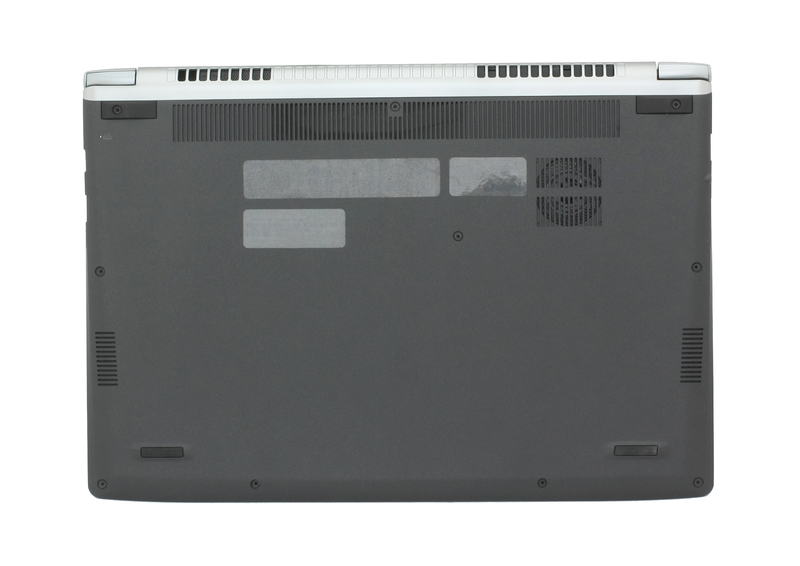 The sides are just 14.5 mm thin but that doesn’t mean that the ultrabook skips on the essential connectors. The left side comes with an USB 3.0 port, SD card reader and 3.5 mm audio jack while the right side holds another USB 3.0 port along with a full-sized HDMI and USB-C 3.1 Gen 1 with up to 5 Gbps transfer speeds. The back side of the machine offers two fairly big vent openings for better cooling. The interior continues the already known design concept with brushed aluminum surface, chamfered edges and the familiar silver-colored plastic element on the screen hinges with the Swift 5 branding on it. It definitely feels nice and premium but attracts smudges and fingerprints. The keyboard tray appears to be stable and doesn’t give in under pressure. The keyboard, on the other hand, feels slightly mushy and shallow. 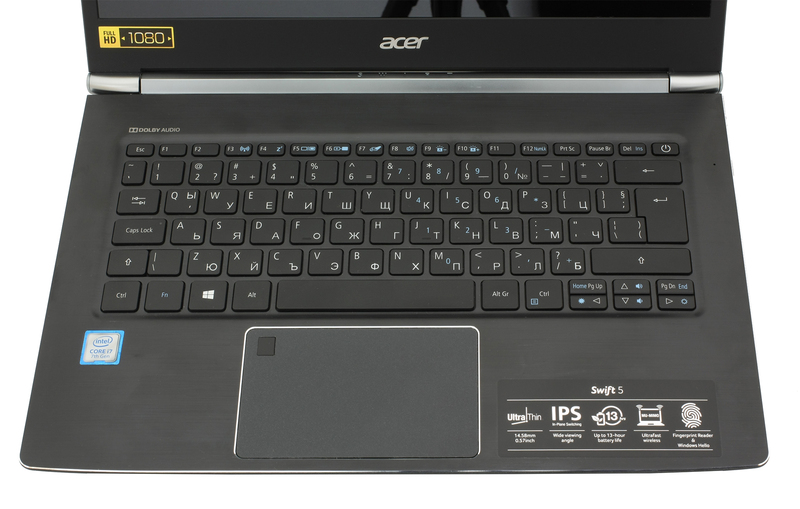 There’s a clicky feedback to each key press that compensates to some extent but we’ve definitely seen better from Acer. As for the touchpad, it feels very stable, accurate, responsive and offers light and delightful mouse clicks. There’s also an integrated fingerprint reader located in the upper-left corner of the trackpad area. The size of the touchpad is satisfactory. 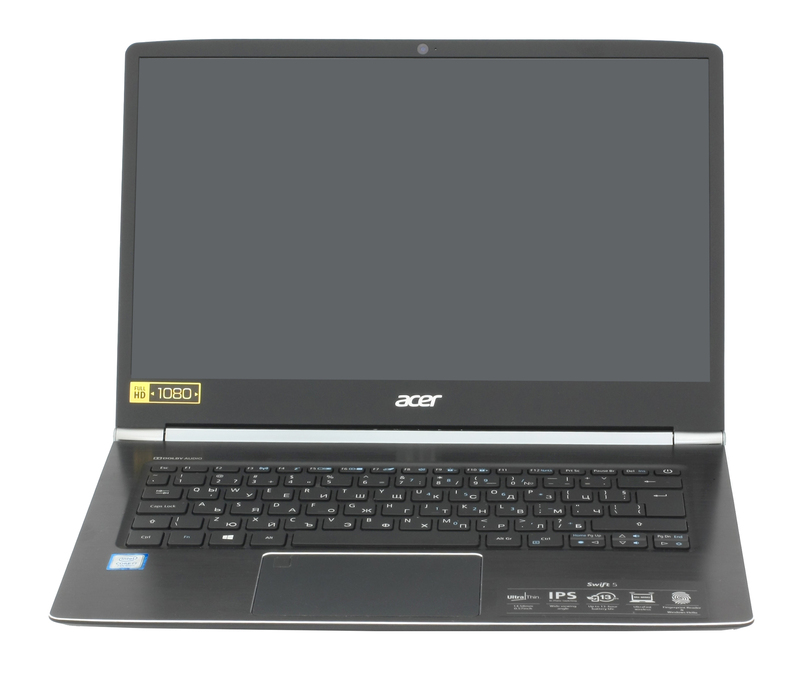 Acer has once again proved that not all affordable ultrabooks have to be cheaply made. The Swift 5 comes at a refreshingly low price while offering excellent build quality and choice of material. 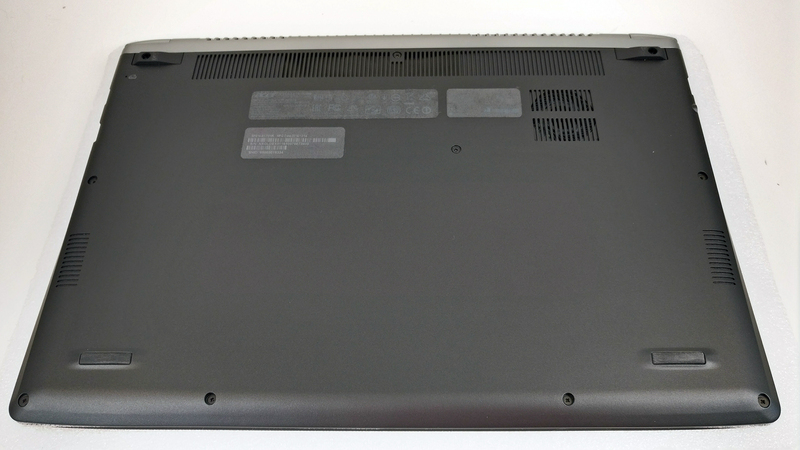 The chassis is robust, lightweight and thin while offering a 14-inch Full HD IPS screen in the usual 13-inch form factor. The only letdown here is the shallow keyboard. 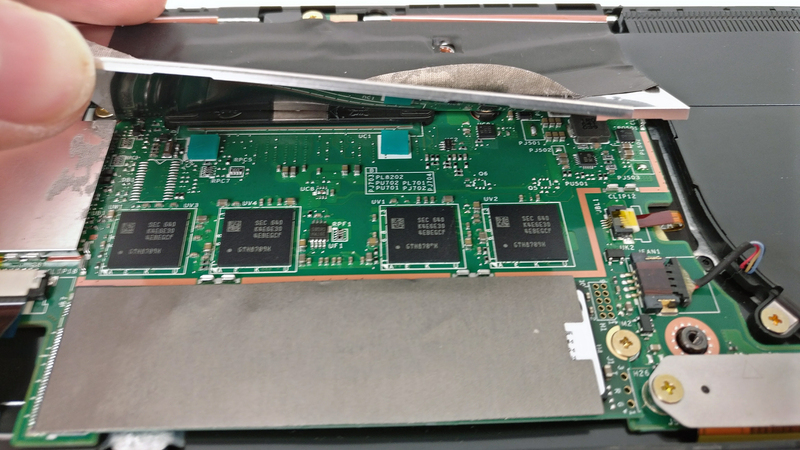 As every ultrabook out there, the Acer Swift 5 doesn’t have a dedicated service cover for maintenance and upgrades but its bottom piece comes off easily. You just have to remove all the screws and pop the bottom plate open. 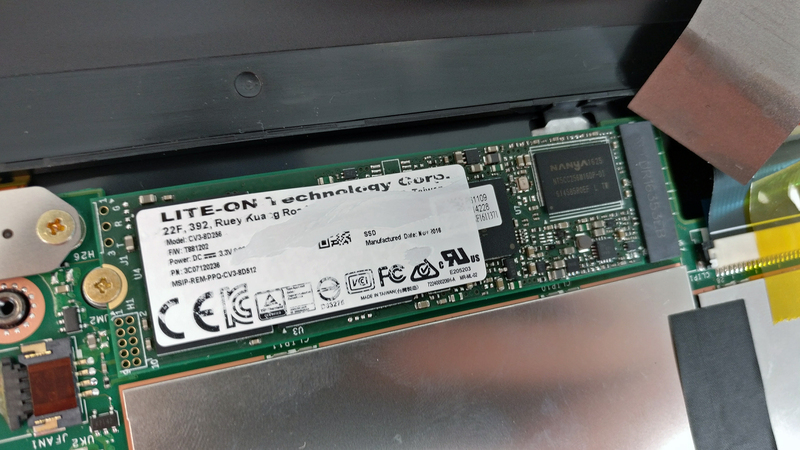 The motherboard supports M.2 PCIe NVMe SSDs in 2280 sizes but the unit we reviewed came with an M.2 SATA drive manufactured by Lite-On with 256GB capacity. Unfortunately, the memory isn’t available for an upgrade since it’s soldered to the motherboard. It’s 8GB LPDDR3-1600 of RAM and should be plenty for office work, multimedia and everyday tasks. 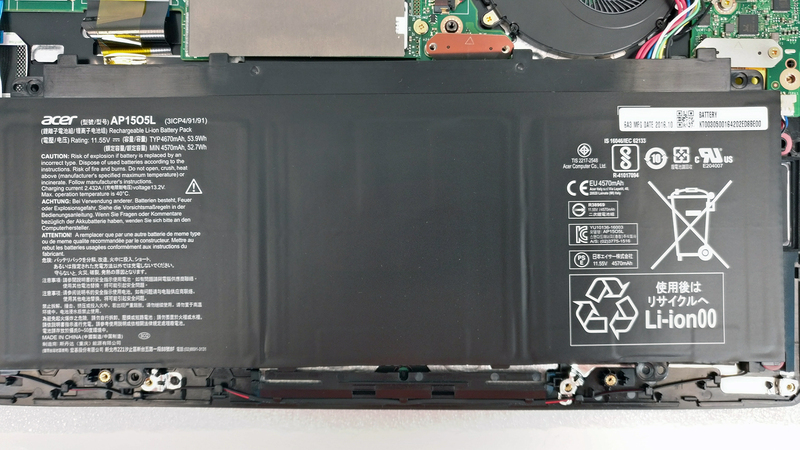 The battery can be found under the wrist rest area and it’s rated at 53.9Wh. The cooling system is quite simple and consists of one small cooling fan and a single heat pipe connected to the CPU’s heatsink. Our temperature tests show excellent cooling performance even under continuous and heavy workload. The display uses an AU Optronics B140HAN03.2 IPS panel with Full HD (1920×1080) resolution in a 14-inch diagonal. This means that the pixel density is 157 ppi and the pixel pitch is 0.16 x 0.16 mm. The screen can be considered as “Retina” when viewed from a distance equal or greater than 55 cm. The Swif 5’s display has comfortable viewing angles due to the IPS panel. The maximum brightness is pretty high – 354 cd/m2 in the middle and 331 cd/m2 as average across the surface with 12% deviation. The color temperature is 6600K and it’s pretty close to the optimal 6500K. The contrast ratio is exceptional – 1400:1. 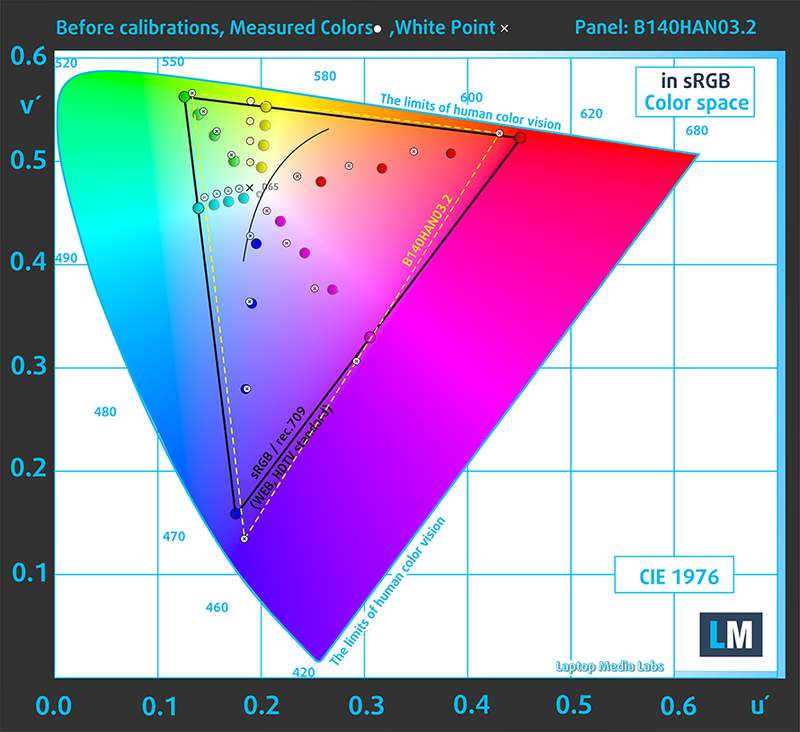 We’ve also measured the dE2000 color deviation across the surface of the screen and the maximum value was 3.0. It’s not bad conisdering that usually anything above 4.0 is unwanted. 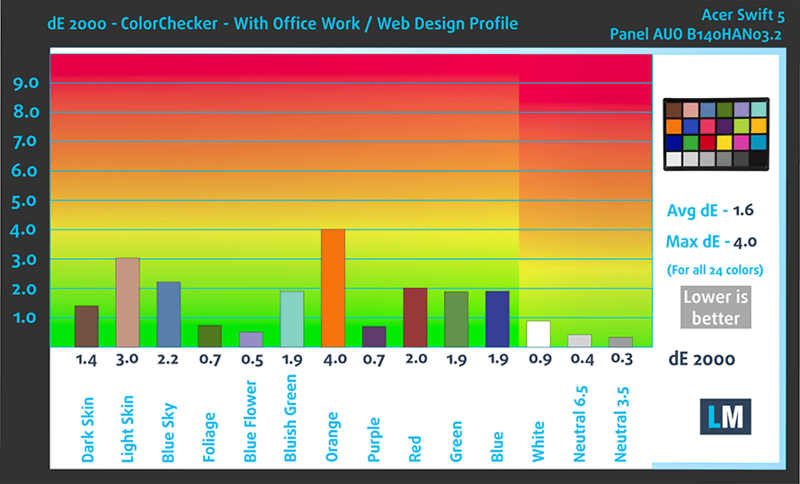 The display covers 93% of the sRGB color space making it ideal for office work and even multimedia. We recorded Fall Time + Rise Time = 26ms. The presented IPS panel has literally no flaws for the asking price, of course. The sRGB coverage is wide, the contrast ratio is excellent, the maximum brightness should be enough for outdoor use, which is pretty important considering the form factor of the laptop and we didn’t detect any flickering across all brightness levels making it safe to use for long periods of time regarding PWM. In any case, if you want to make the most out of this display, we suggest purchasing our profiles as they improve visibility in dim areas of the image and deliver considerably better color reproduction. 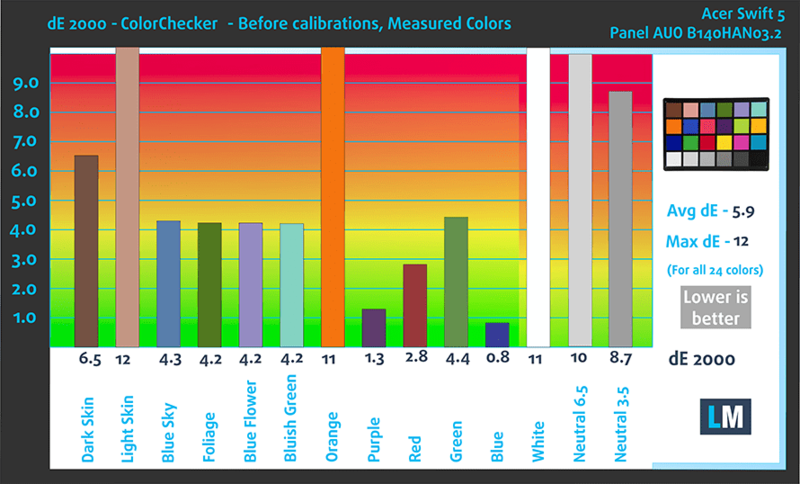 The Health-Guard profile, on the other hand, will reduce the negative blue light emissions and preserve color accuracy as much as possible. The sound quality of the laptop’s built-in speakers is pretty good and should satisfy the average user. The clarity is definitely above average for an ultrabook. 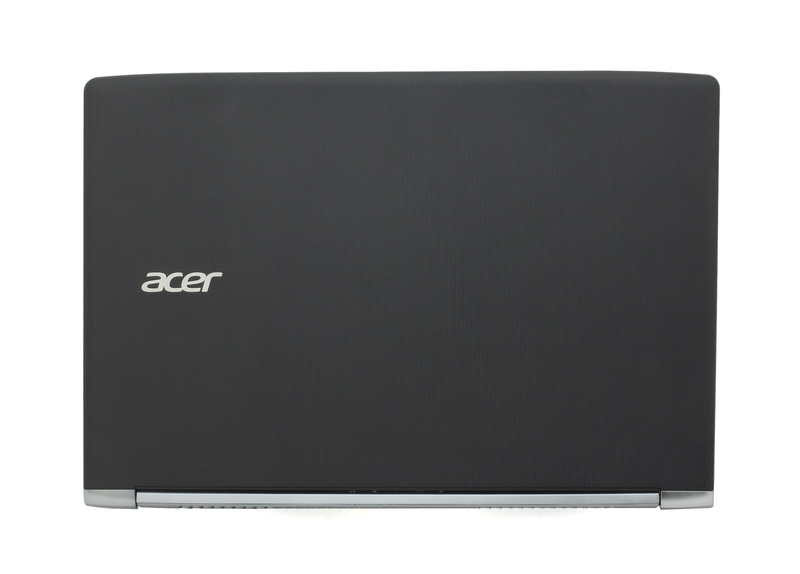 We used the pre-installed Windows 10 (64-bit) for the writing of this review but if you want to perform a clean install of the OS without the bloatware, we suggest downloading all of the latest drivers from Acer’s official website. 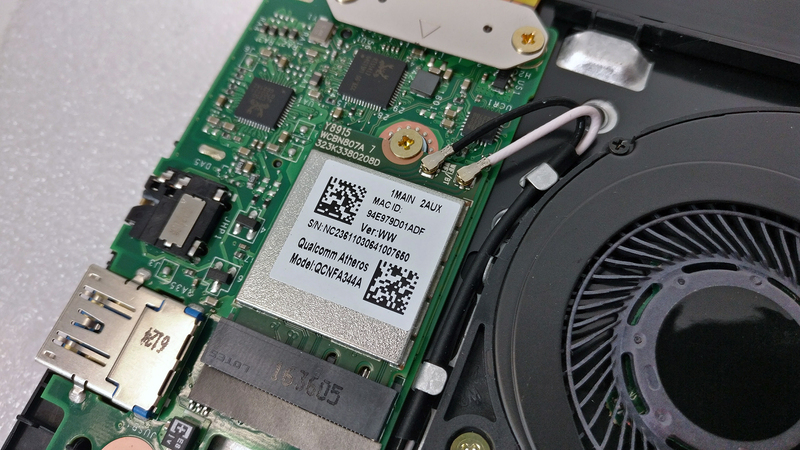 Despite the thin and light chassis, the engineers over at Acer were able to cram inside a big 53.9Wh battery unit that’s the main reason for the excellent endurance. We are really impressed by the web browsing and video playback scores of the laptop. It’s just a few minutes shy of the current record holder the ASUS ZenBook UX303UB, which sports a similar battery, CPU and screen size. Interestingly enough, both laptops – the Swift 5 and ZenBook UX303UB – score identically when it comes to video playback. This is downright superb battery performance so it’s definitely one of the key selling points of the Swift 5. All tests were performed with the same settings as always – Wi-Fi constantly running, Windows battery saving feature turned on and screen brightness set to 120 cd/m2. One of the most impressive scores we’ve seen – 713 minutes (11 hours and 53 minutes). Considerably lower but still an excellent result – 550 minutes (9 hours and 10 minutes). Of course, the laptop isn’t made for gaming but it’s good to know that it can last more than three hours under heavy load – 192 minutes (3 hours and 12 minutes). Fritz is a chess benchmark that tests the computing capabilities of the CPU with various chess moves. The Intel Core i7-7500U scored 6.891 million moves per second. In comparison, one of the most powerful chess computers, Deep(er) Blue, was able to squeeze out 200 million moves per second. In 1997 Deep(er) Blue even beat the famous Garry Kasparov with 3.5 to 2.5. Intel’s HD Graphics 620 uses the GT2 version of the graphics chip with 24 EUs (Execution Units) reaching as high as 1050 MHz and it has a base frequency of 300 MHz. However, the maximum operating frequency depends on the CPU, whether it’s the Core i3-7100U or the Core i5-7200U or the Core i7-7500U. Since the iGPU doesn’t have a dedicated memory – or eDRAM for that matter – it uses the available RAM on the system which is 2x 64-bit DDR3 or DDR4. The TDP depends on the CPU model but it’s usually equipped with a SoC rated at 15W including the memory controller. Its performance should be enough for multimedia activities, light applications and gaming on really low resolution and minimum graphics settings. We perform a long stress test on the CPU and GPU to see how the cooling design handles heavy loads and assess the overall stability of the system in the long run. 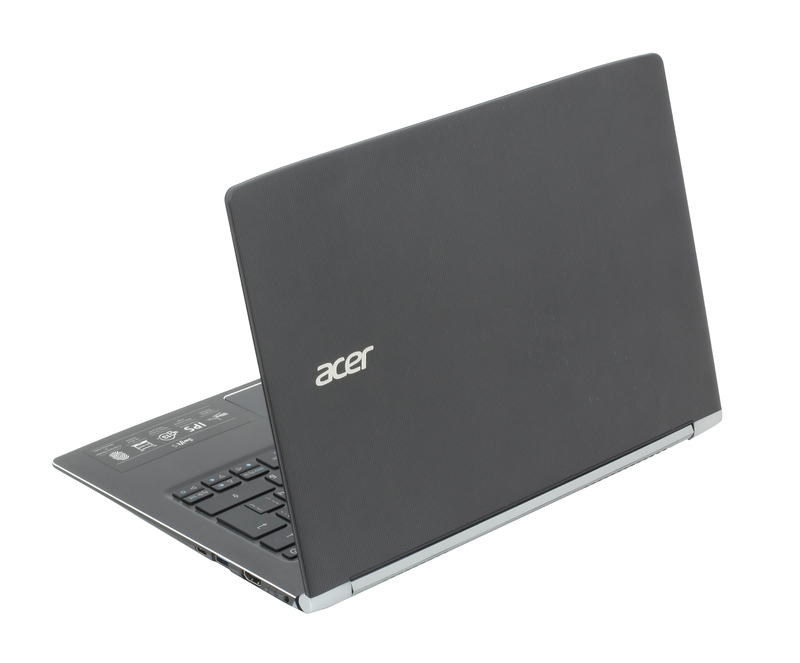 However, it’s not a representation of real life usage, especially considering the nature of the Acer Swift 5 ultrabook. The one hour CPU stress test revealed that the system is able to utilize the full performance of the CPU for a short period of time (3.5 GHz) and then gradually goes down to 2.8-2.9 GHz while keeping relatively low temperatures considering the nature of the test and the size of the chassis. Before finishing up, we turned on the GPU stress test as well. Nothing unexpected occurred during the torture test – the CPU’s frequency went down so it can give enough headroom for the iGPU to perform while temperatures dropped by a tad. Interestingly, even after extended heavy workload, the surface of the interior didn’t get hot at all. Yes, slightly warm in some areas but it’s nowhere near to what we are used to seeing in today’s ultrabooks. This suggests of stable and efficient cooling system that shouldn’t cause any trouble in the long run. 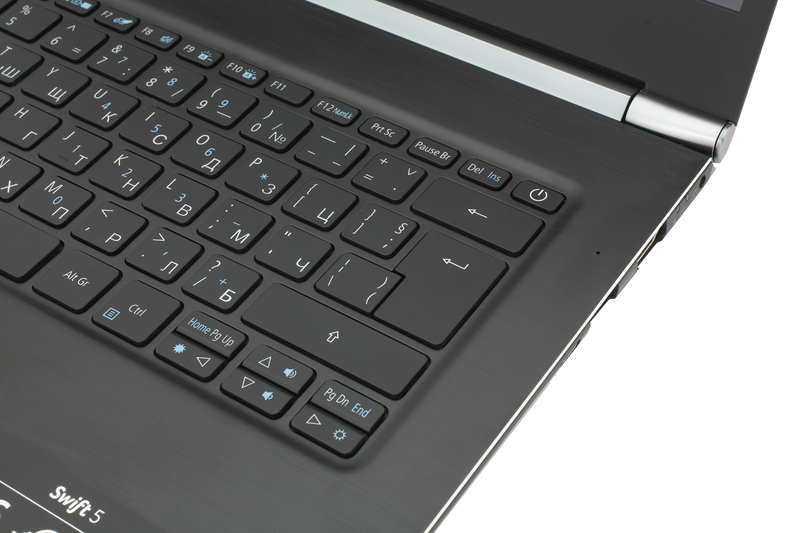 Performance-wise, the laptop will do just fine for everyday tasks, multimedia and office work. If you are looking for something more powerful, the new ASUS ZenBook UX410UQ, which we will review pretty soon, is a nice choice since it has a dedicated graphics card – GeForce 940MX, which handles graphically-intensive tasks quite well. Another thing we can add to the cons list is the storage. Although, the notebook supports PCIe NVMe SSDs, most of the units ship with an M.2 SATA SSD. We really would have appreciated at least a generic PCIe NVMe drive rather than a Lite-On SATA SSD. Finally, the key selling points of the Swift 5 are the screen and battery life. Both are superb and should deliver excellent user experience on the go. But if you still want the best out of the best out of the AUO IPS panel, we suggest purchasing our custom profiles that will improve overall image clarity, color accuracy and reduce the negative blue light emissions when needed.